I Would Love To Hear.....What Changes Do You See In The Library and Teacher Librarian? Next week I am going to Boston to present at November Learning's Building Learning Communities Educational Conference. I have been working on a brand new presentation called What's All This Change About In The Library? for BLC. I am having a lot of fun creating it but today realized I needed more voices than just mine. I created the Padlet above and shared it on Twitter, Facebook, and in an email. It has been live for about 30 minutes and there are already several responses. One more reason I just love my PLN and the community of wonderful people I connect with everyday. I can't wait to read these and share them in my presentation. 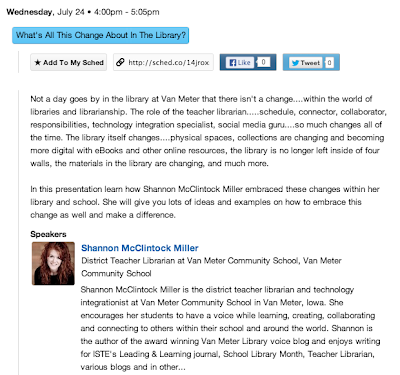 We all have a difference story and unique ways that the roles of the teacher librarian and library are evolving. I would love to hear your voice too.....Please add to the Padlet and tell all of us the changes that you see too. And learn more about BLC here and by following #BLC13. 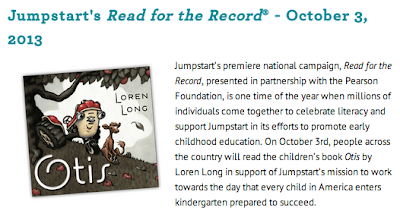 Join Readers Around The World And Loren Long's OTIS For Jumpstart's "Read For the Record" Day On October 3rd! One of our favorite days for the last seven years has been Read for the Record sponsored by Jumpstart and the Pearson Foundation. On this day we pledge to read the official Read for the Record book at Van Meter while others are reading the same book around the world. We read within our school and have connected to several other students and teachers, while authors and illustrators have joined us to read too. Last year in 2013, 2.3 million participated in Read for the Record and read The Little Engine That Could. We loved reading this book together as a community and added it to the list of other wonderful books such as Corduroy, Snowy Day, The Very Hungry Caterpillar, and Llama Llama Red Pajama. This year I was especially excited to see what book that we are going to read on this day! 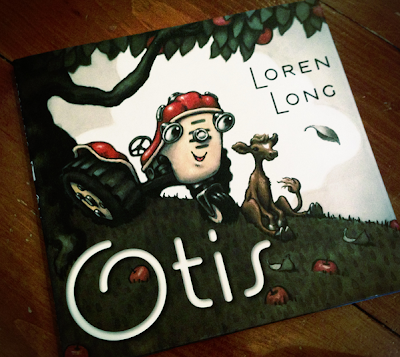 On October 3rd we will all be reading, sharing, and loving Loren Long's Otis. This sweet, beautifully illustrated book of friendship is a special favorite of Van Meter and at our house. I grew up on a farm in eastern Iowa so I am especially drawn to the characters and setting. You can pledge to read here. There is a wonderful activity guide available to download on the site along with storytelling activity kits as you pledge to read. I can't wait to have our students create a barn mural for the library and share friendship pictures with others around the world (these two activities can be found in the guide). I also love how We Give Books, a free digital reading initiative created by Penguin and the Pearson Foundation, gets involved with Read for the Record. As in years past, the record breaking book is available online for free at We Give Books. 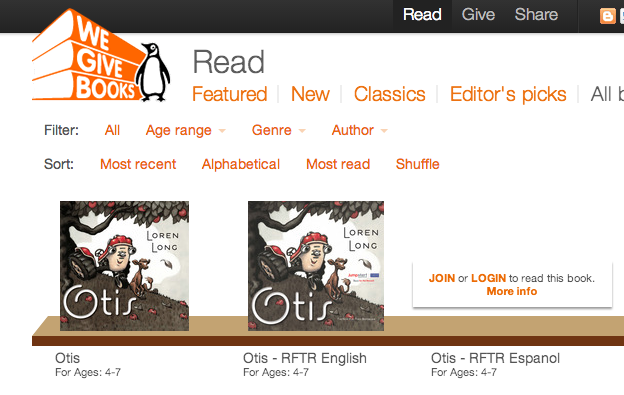 This gives everyone access to the selected book online. I always love sharing the link to the book with our families and with others too. It is fun for everyone to read this special book each year. 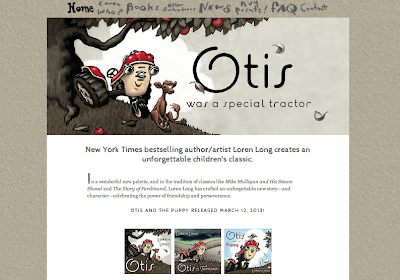 You can read Otis in English and Spanish at the We Give Books website. While you are there check out all of the other books they have too. 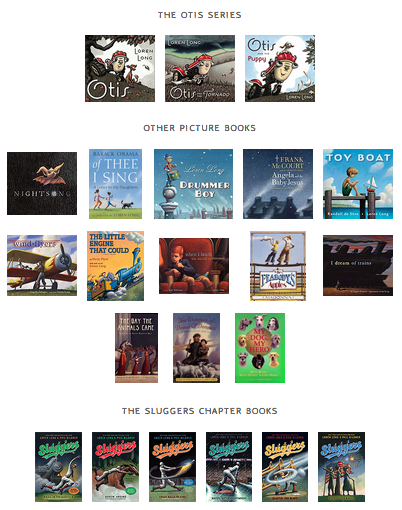 This is one of our favorite websites for reading in our school community. This video is another fun way to get your students, teachers, and community really excited about the celebration and reading. and all of his others books too. 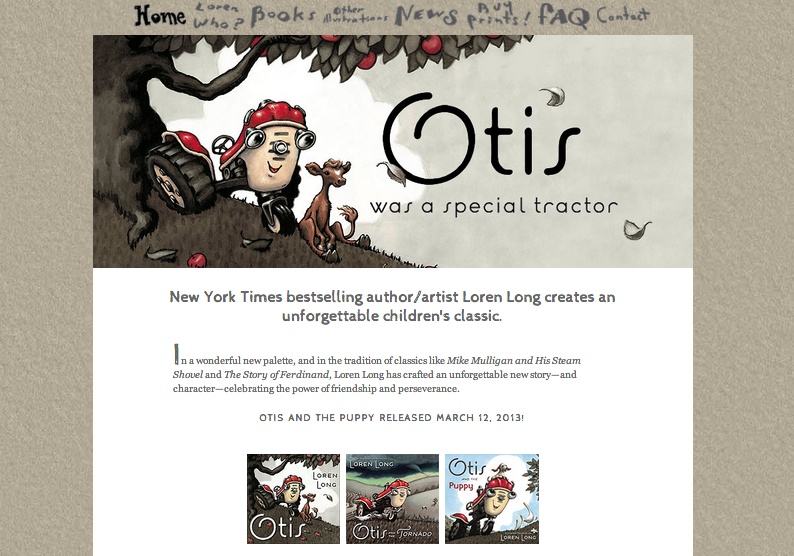 You can follow him on Twitter at @LorenLong. Jumpstart is on Twitter....@Jumpstartkids and follow #ReadfortheRecord too. I hope to see all of you Reading for the Record on October 3rd! 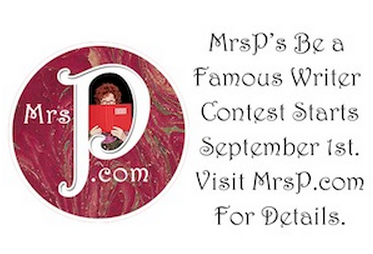 Mrs. P Revamps Writing Contest to Focus on Classrooms Celebrating 5 Years of her “Be-a-Favorite Writer” Contest for Kids! For the last few years, the students at Van Meter have participated in a very special writing contest. And to make it even more special to all of us it is one put on by our friend Mrs. P! 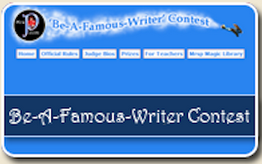 The contest is called the "Be-a-Favorite Writer" contest! After meeting Mrs. P on Twitter three years ago, she has virtually visited with our students several times....always bringing so much fun and excitement to our library and literacy! When our young people find out about Mrs. P's Be-a-Famous Writing Contest they just love participating and writing something special to share in the contest and with others. 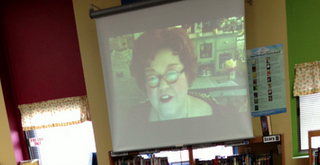 Last year Meridan Boyd (who is pictured here talking with Mrs. P during a class Skype) was one of the finalists in the writing contest. She wrote a story called The Horse Indeanna. It was such a honor for Meridan and we were all very proud of her too. 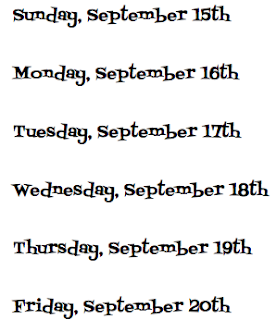 This week I was talking with Mrs. P about her writing contest that will be launched on September 1, 2013. Below are the things that we spoke about. There are a few changes this year. It will be very helpful for you to know about them too. Why did you decide to make the contest just for schools? Well, over the last couple of years we have done a lot of Skypes and various events using technology with classrooms, like yours. We learned from a lot of the teachers that having the permission forms for all the kids was a bit of burden. So, we decided to work directly with teachers this year. Teachers will be submitting the entry on behalf of their class. Teachers will have a choice to do a group writing project for their story, or have individual stories done and then have their class vote on the one to submit. Each class will be submitting just one story. We also changed the age groupings to have just one category for grades kindergarten to fourth grade. Additionally, we have extended the contest to run from September 1st to November 15th, so there is more time for the teachers and students. I am also very excite that we will be promoting a “live” event using Google Hangout and Youtube to stream my reading the winning story live! We loved it when we did the poetry summit with your earlier this year. I see there is a theme this year too to write about, can you tell me how this came to be? Yes, the theme is “Magic”. Obviously, I have my Magic Library that I read from, but I also came up with this because having a writing prompt can be a useful guideline to get kids going. We haven’t done that before and decided to try it this year. I also was inspired by the past contest winners that I checked in with for a series this summer called “Where are They Now?” and their advice was so magical, it seemed like a wonderful theme to celebrate the 5th year of the contest. Your website says the the schools win all year, what does this mean? Our sponsors, BuyerTopia, Tales2Go, Powell’s Books, and Polka Dots Publishing and Penelope the Purple Pirate are all great companies that promote the importance of reading for children. They are making possible the purchase of books that the schools get to select themselves, and also an audio listening license from Tales2Go. So the teachers get to select what books they want for the classroom which we thought was really great. 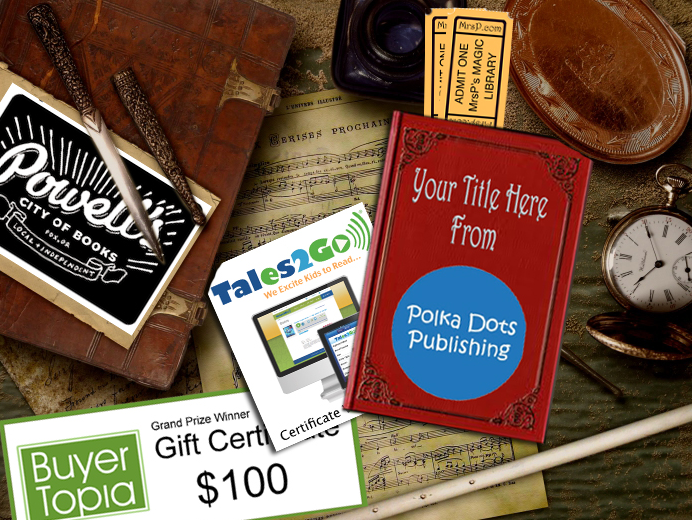 Buyer Topia Gift Certificate for $100 to purchase books. Will you still have the celebrity judges? Oh yes, because it is such fun for the winners to get comments from the judges. This year we have Melissa Peterman who is an actress and comedienne, best known for her role as Barbra Jean in the television comedy series Reba. Currently, she stars as Bonnie Wheeler in the ABC Family series Baby Daddy, and as host of ABC Family's Dancing Fools, ABCs Bet On Your Baby, and CMT's The Singing Bee. She's also a mom to a 8 year old, so knows how to spot a good story. And since I just love teachers, we have 6th grade teacher Karla Duff, from Oelwein Middle School in Oelwein, Iowa . She’s been there for the last 20 years. 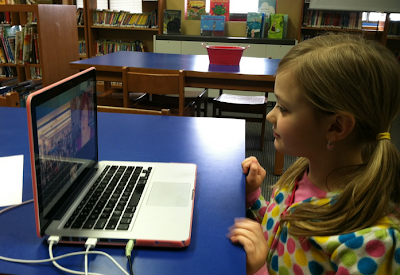 I met her Skyping with her classroom. We also will have one more judge announced before the contest opens. There has to be a little mystery when we announce the grand opening of the contest! Why do you feel this type of contest is important for kids? It helps build confidence and self esteem. And many of the students have gone onto be role models in their school or state by being a good a writer. This is so important for others kids to see. Just like in sports and music programs where kids can win a competition, it’s important for kids to be able to be recognized for their writing. What are you doing to celebrate the 5th anniversary of your writing contest? Well, I decided to check back in with past winners and finalists of the contest and created a “Where are they Now” series on my Reading is Cool blog. It will run for 8 weeks, and it will feature excepts from the past winners new works & Q&A’s with the various young authors. It was so inspiring to read what these talented young writers have been up too, that I really wanted to share what they had to say to other kids and parents. There are some very wise insights. Several have gone onto win some major writing awards, like the Scholastic Arts and Writing Contest, the Betty Award and the PBS Kids Go Young Writers and Illustrators Contest. The contest opens September 1st for entries. You can go here for the link to the contest. Here is a video just for teachers too! 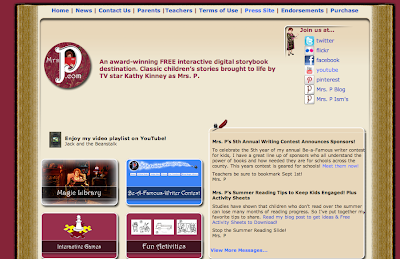 And don't forget to also check out Mrs. P's Magic Library online and the Mrs. P app too. It will be a favorite place to go.....just like it is for all of us at Van Meter. Thank you Mrs. P for having such a wonderful writing contest for all of us every year. We can't wait to participate and read the stories that win too. Timbuktu Magazine....A Wonderful iPad Magazine For Our Young People! 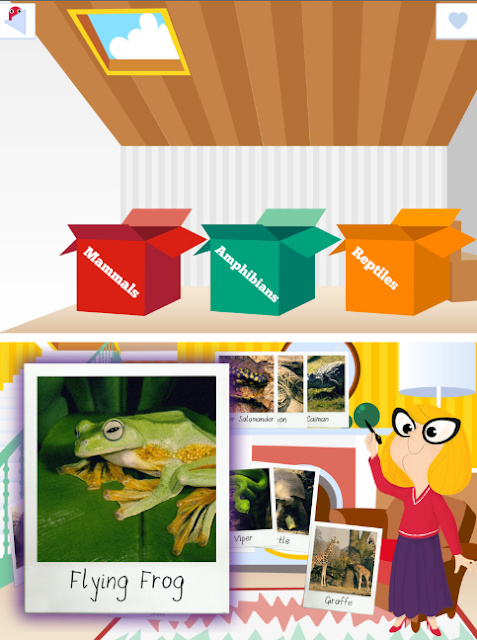 A few weeks ago I came across a new iPad magazine for elementary students called Timbuktu. I was drawn in right from the beginning with the wonderful illustrations, bright colors, and engaging content. And the words....The iPad Magazine For Children. Then I connected with Francesca Cavallo and I learned even more....to with with all of you too! Timbuktu Magazine is an iPad magazine for elementary school children. We started Timbuktu because we felt the need of a digital product for children that would treat them as peers, and that would promote imagination as a tool to know and change the world. The magazine and all our other apps are based on the Reggio Emilia Approach to education, a pedagogical method forged in Italy that focuses on creativity as a way to foster experiential learning. The stories inside Timbuktu Magazine are Common Core State Standards aligned, but they are designed to kindle children's curiosity and care, rather than to encourage a "meet the expectations" kind of feeling. We firmly believe children have the right to approach learning in a free, creative way, and to understand that education is something that will empower them to help others, not just to please their family or their teachers. In order to help kids approach learning from this perspective, we designed a group of fun characters, but each of these characters has a flaw: for example, Betty is a girl Wiener dog with a passion for drawing, but very bad at grammar. She writes a diary on Timbuktu, and kids help her to get better correcting her mistakes. Bello is a detective umbrella passionate about math, but very forgetful. Kids help him solve the mysteries happening in the city of Timbuktu solving what's basically a two-step word math problem. 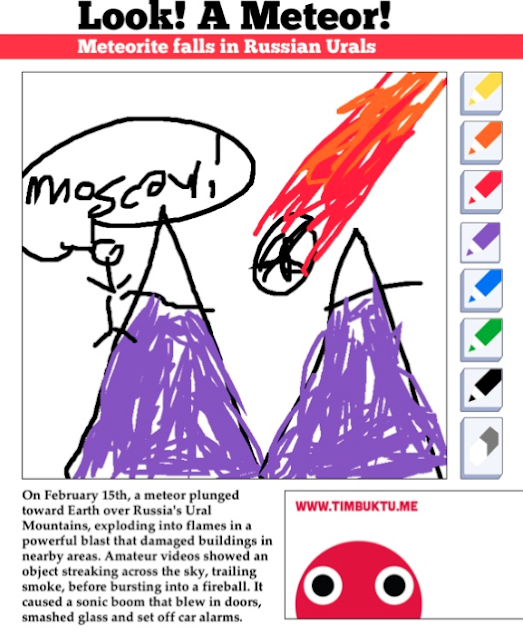 Timbuktu Magazine is a monthly magazine with 9 interactive stories per month. It's not our only title: we develop many other apps that help kids play in a relaxed creative mode. No timed missions, no performance anxiety, no stressing sounds and no flashy effects. We just launched the first Zen app for kids for example: it's called Sand Drawing and it lets them simply draw on the water's edge, with a surf clearing the drawing when they're ready to start over. Another app that's proving very successful is Oscar Pizza Chef, teaching kids how to make a real Italian pizza. All our apps are designed in Milan and developed in San Francisco, where our HQ is. We also have a special feature in each magazine, developed in partnership with the European Space Agency: it's called Discover Outer Space, and it's an interactive article for kids about the latest space discoveries. and as you can see.....it is easy to love! the Timbuktu Magazine Facebook page. Lets All Connect For Dot Day and Make Our Mark On The World! 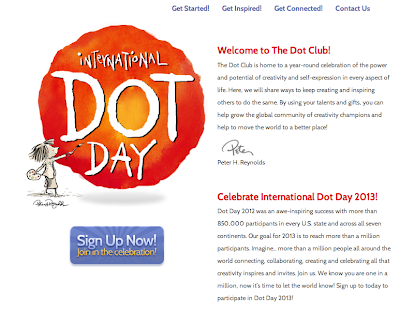 For the last three years we have celebrated International Dot Day in our school and with others around the world. 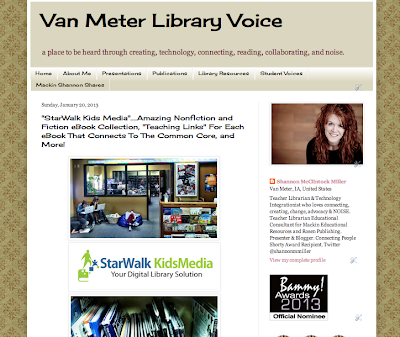 We have connected in the library, in our community, and online. We have made our mark through reading, writing, listening, creating, and collaborating. And we don't just celebrate on September 15th. We celebrate all throughout the year and encourage our young people to make their mark every single day in all things they do. 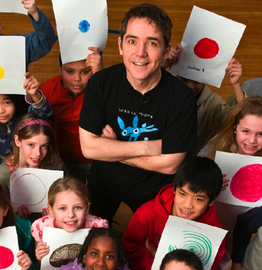 Just like Peter Reynolds and his beautiful book The Dot has inspired all of us and will continue to do so this year. Last year over 850,000 participants in every U.S. state and across all seven continents connected to celebrate the creativity, inspiration, and voice in all of us. This year the goal is to connect more than a million people around the world. And I know we will! 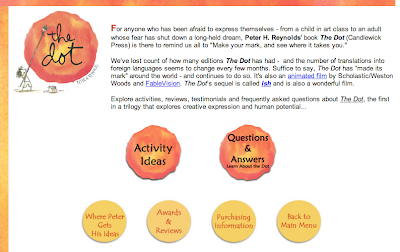 Over the last few weeks at the ISTE and ALA conferences, on Twitter, Facebook, and through emails I have had dozens of comments and questions about Dot Day celebrations and connections. And after talking to my dear friend Matthew Winner we decided it was time to start connecting and talking about Dot Day! We have created the Google Doc above so everyone has a place to start these connections and a place to start collaborating. 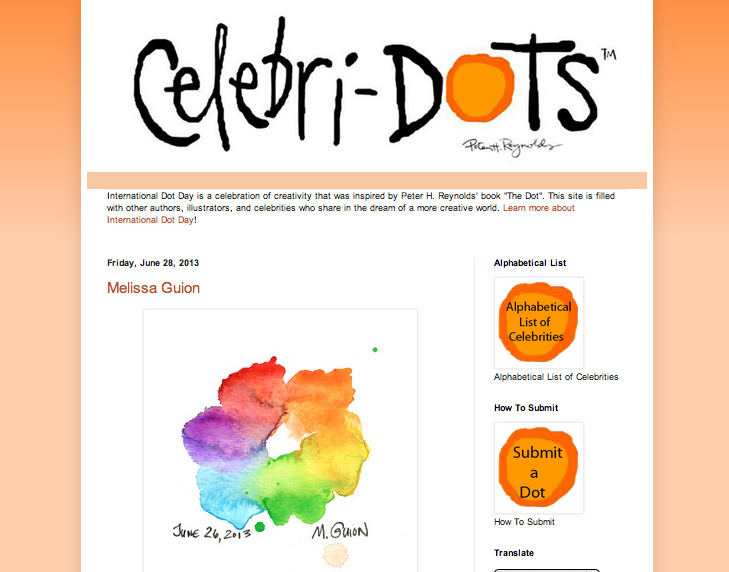 Please go to the "International Dot Day Connections 2013" Google Doc and leave your mark by adding your "Dot Day MARK" with all of your contact information (like the MARK I made above). Then start connecting....looking for connections that will work for your students, school, and you. The days above are just a beginning....add more if you would like. This is a Google Doc that is all of ours. We have had so many wonderful connections through our Dot Day celebrations. My dear friend John Schu and I created this Animoto of our Dot Day in 2011 and it is filled with ideas. Today The Students Made Their Mark...On Each Other, The World, and Me! What A Fun Week Celebrating Dot Day! I have also love the ideas that the Celebri-DOTS blog gives all of us. My amazing friend Terry Shay started this blog last year. It is a place "filled with other authors, illustrators, and celebrities who share in the dream of a more creative world." 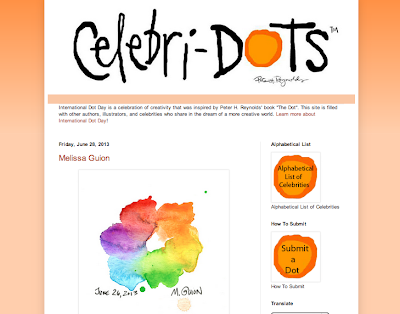 I can't wait for my students to make their very own Celebri-DOT too. on the International Dot Day Facebook page. 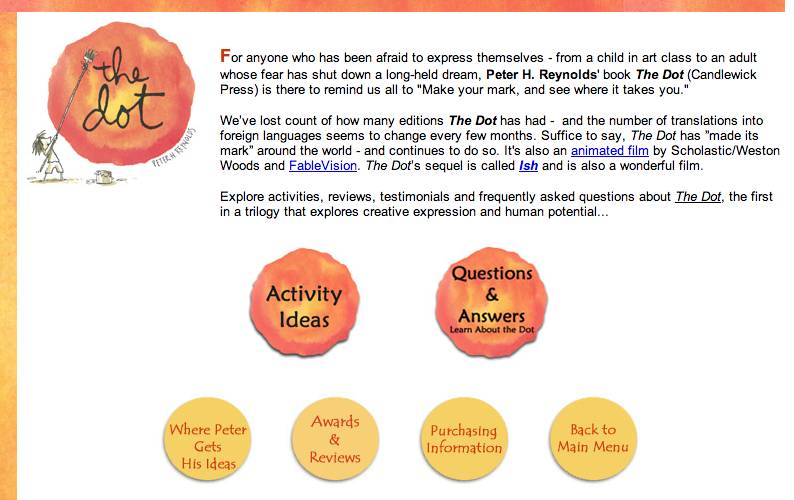 You can find lots of great resources, activity ideas, and information on Peter Reynold's webpage for The Dot. I can't wait to start connecting and planning for Dot Day. It is one of my favorite times of the year. It inspires all of us to remember how special and unique each and every one of us are. We all have a mark to leave on the world and the people we touch. 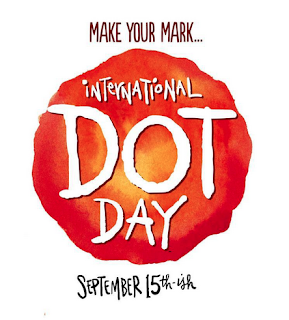 Lets leave our mark on the world for International Dot Day. Please sign up here to join in this special event and join our Google Doc to connect with all of us. On June 27th, Broadband for America launched Faces of Innovation. 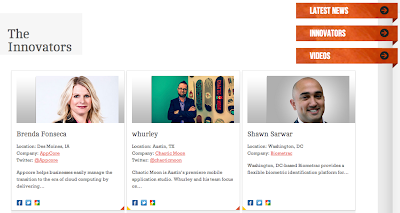 "Faces of Innovation is a new website that highlights the innovators and entrepreneurs who are powering today's growing Internet economy. Faces of Innovation presents news and interviews about and with some of the hottest internet innovators working today. From coast to coast Faces of Innovation is on the constant look-out for apps and programs that improves lives using America's fast, reliable broadband networks." 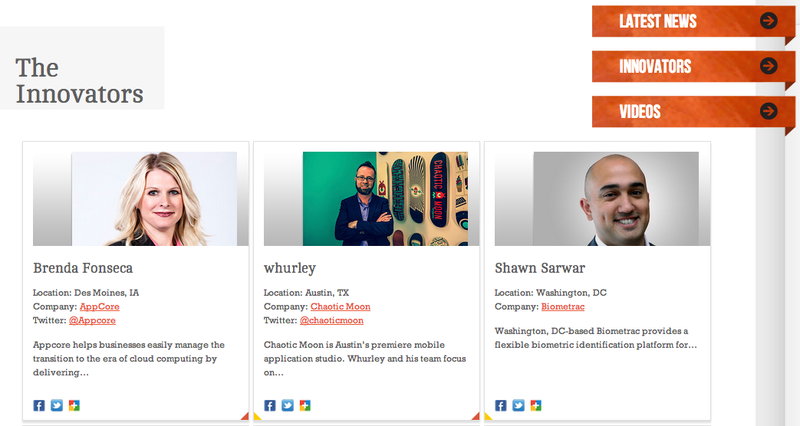 I am honored to be one of 21 innovators that are featured on "Faces of Innovation." 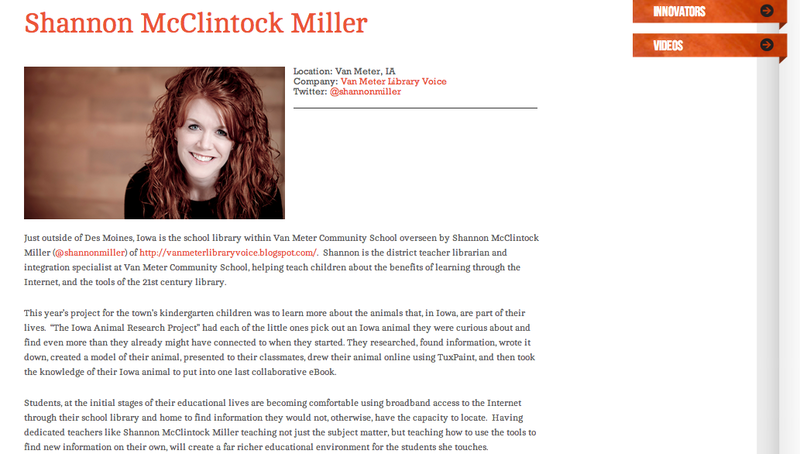 I am excited to share my story about how I use the internet and digital resources to bring creativity, connectivity, and to enhance the learning experiences of my students in the school and library every day. You can read about all of the innovators on the website. Each one has such a wonderful story of making a difference. I just loved reading about everyone....We are all using the internet in different ways. My story is featured here. Broadband for America can be found on Twitter at @broadband4us and on Facebook. 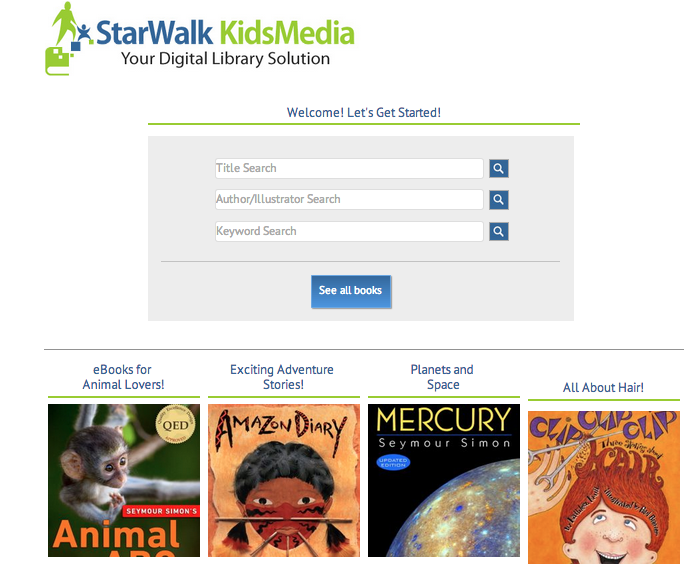 StarWalk Kids Media eBooks FREE In July With the "Summer Pop-Up Library"
Today StarWalk Kids Media and Seymour Simon announced something very special and fun! "We are very proud to introduce the StarWalk Kids #PopUpLibrary!. 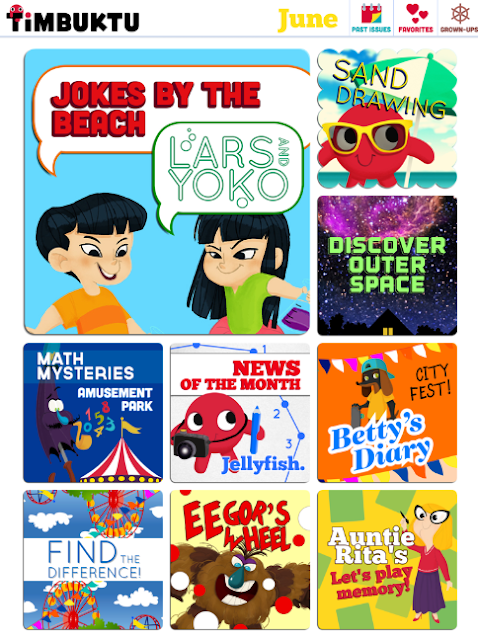 This FREE summer reading program makes all the great eBooks in StarWalk Kids collection free for anyone to use, for the entire month of July. Thanks for a great year! It's time to give back." All that you need to go is go to this page above on the StarWalk Kids Media website and click on the blue button in the center that says "See All Books". It will take you to all 160 eBooks that are available. There are amazing fiction and nonfiction from Seymour and so many other wonderful authors. At Van Meter, we have had StarWalk Kids since the beginning of the year. 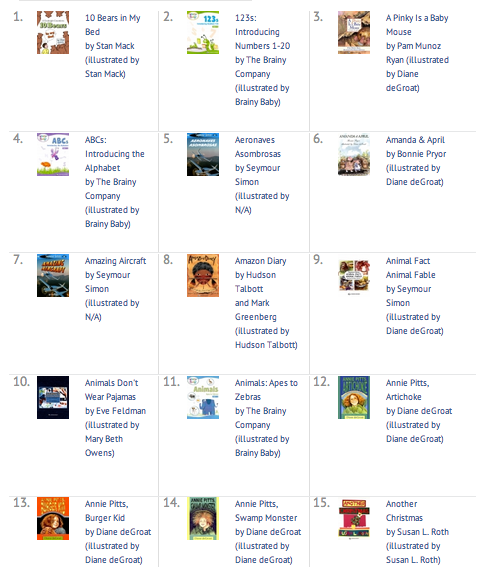 These are a lot of the favorite eBooks of our families....Everyone just loves the great selection and all of the eBooks. 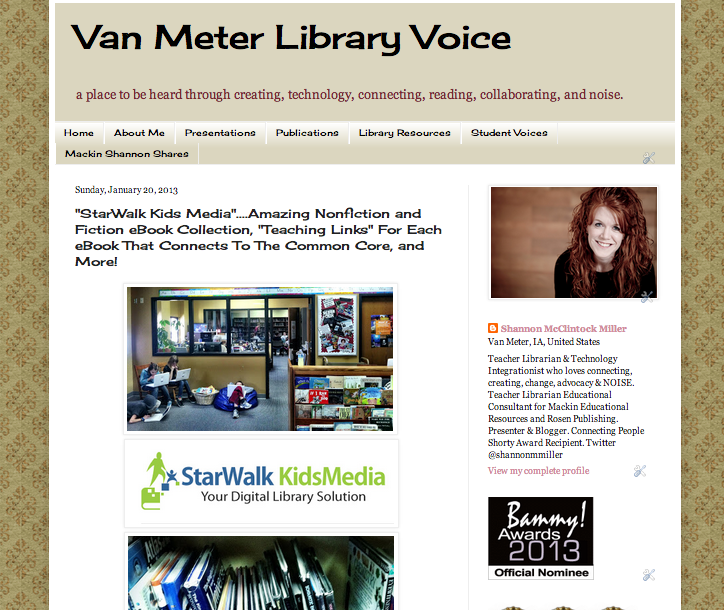 You can read about what StarWalk Kids has brought to our school community here. Please share this special opportunity others and give everyone the chance to have a Pop Up Library this summer too! You can also follow along with #PopUpLibrary and @StarWalkKids on Twitter. Thank you Seymour, Liz and everyone at StarWalk Kids. You make such a special difference.